Hello - . :Early Learning Community:. Just was referred to the site today from my sister. Looking forward to giving my 7mo old little girla wonderful start to her education. Hi and welcome to the forums! We are glad to have you here. You are in the right place for learning about all the different ways to help your baby learn. I hope you download Little Reader if you haven't already. 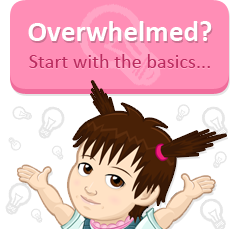 It is a fun, customizable program that will help your baby learn countless words. My son is almost 8 months old, and he really enjoys it! Please let us know if you have any questions. Thanks for referring more people to the forum - we're always happy to grow our community. We also hope that you will enjoy teaching your little girl with Little Reader - there's just so much fun in discovering the wonderful game of learning! I look forward to reading about your parenting experience with her, and I'm sure we all have much to gain from your shared stories. Thanks for the kind words! I'm telling every mommy and daddy I meet about this site and the great program! It's so easy to use the reader program and the forums are so helpful! Its been great fun customizing the family category with our family pictures and seeing Matteson's reaction to learing that those "people" have "titles" and names!! I can't wait till she gets a little older and starts spekaing!